It is not a resolution. It is one word to focus on. 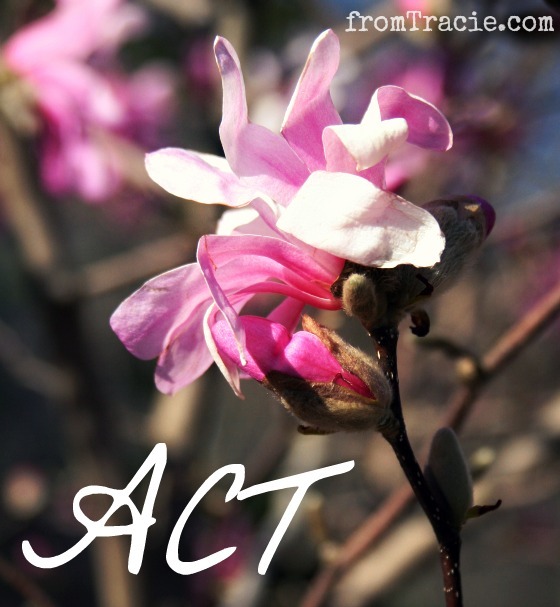 My word for 2013 is ACT. I spent a lot of time thinking about my word for this year. I was drawn to the word change, feeling like 2013 is going to be a year of great change for me. But it did not feel completely right. I immediately knew that I had found my word. Act. If I want to see big changes in my life this year, it is important that I don't just sit quietly and wait for change to happen to me. I need to go after those changes. I need to act on the ideas, plans, and dreams in my heart. I need to be open to where God is leading me, and take the steps necessary to get there. 2013 is going to be my year of action. What one word would you pick for 2013? If you want to join a community of people living out One Word in 2013, check out One Word 365. Ok so I picked 2 words but in my defense you cannot have one and do it right without having the other.. I like Act. Definitely something I need to do more of in my life. I love how your two words work together. Good stuff! What a great focus for the year! act is good. gratitude is an action word, and all that jazz. I like it. Gratitude really is an action word. I like it too. I think Action is everything. Great word. I think you could definitely go for two words if you want! No matter what, I hope that 2013 is a year of restoration for you. Loving this. Act is a great word. I'll have to check out that link. Thanks! Awesome! If you end up picking a word, I would love to hear about it. That is a great focus .... and it is so true ... thinking and hoping will not change things but actions will! Best wishes! Exactly! I'm going to be all about the actions! I think, judging by the goals that I've been setting in place with my support worker and the other goals I've decided on lately, that mine will be "connect". Pretty much all of my goals fit with the word "connect" in some form - even if not the most obvious way. Not only do I want to grow by making connections between past experiences and current behaviours/thoughts/reactions (and then working to change them), but I want to build friendships and connections with people as much as I can this year (especially building up a local friendship base). I also want to strengthen my connection with myself, by doing things that I enjoy and that are good for me. I love CONNECT! That is a great word-focus. Those are really great goals. I could do with a little more connecting in all of those ways myself. Thanks. :) I did end up doing a proper write up of my goals for the year (not quite exactly in the spirit of One Word, maybe, but it's what works for me!) and posting it. This makes me more happy in the pants than I can find words to explain. Also, you've inspired me, as you continue to do. Your word is very similar to mine. You could say it's the same. I love the "change requires action" ... that's awesome! Grow is SUCH a great word! We are going to action 2013 until we own it! I highly approve! So often I tell people that complaining will only get you so far - action will really take you where you need to be. My life is proof of this - if it's not working, change something! This is going to be the year I change things. I think you chose a good one. Happy New Year! Great word. I've noticed a lot of bloggers picking a word or two for a theme for 2013. You can use that to motivate you so many different ways. Love this! You can apply "Act" in so many ways: personally, professionally, through philanthropy, etc. I have been thinking of having "year of action" be my mantra this year. I want to make things happen for good! Good luck! I love your word, Tracie. I think it suits you perfectly and your post is beautiful. I love your theme word ACT! We often have so many ideas but do not execute and take action enough. Mine is very similar. Great blog Tracie. I look forward to more of your posts! What a great word for the year.So true what you write - it all starts with an act! I don't have a word yet, but Monday I'm posting about how my word for 2012 STOP wrecked my world. Thanks for stopping by and sharing. Happy SITS!!! LOVE this word choice. Love the reasons for it. It is perfect. Stopping by from SITS Sharefest on Twitter. ACT - I like it. Its much better than change. After reading so many great words today on Sharefest, I've finally come up with mine - Wholeness. I am working on a strength challenge this year, but didn't want my word to be strength or strong. Instead I want to feel whole. So fitting. No matter what you want to do this year, it all starts with action. Very nice! I love your word for the year. I am so glad to have seen you gaining momentum and energy! Not being a bystander but taking control.